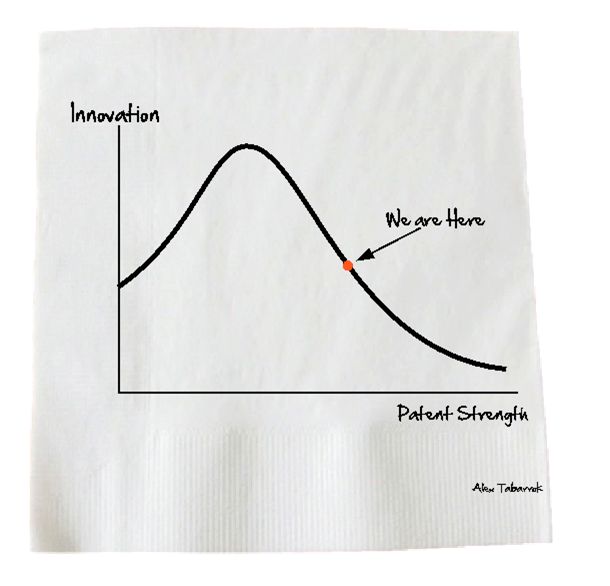 I respect Alex Tabarrock immensely, but his recent post on the relationship between “patent strength” and innovation is, while pretty, pretty silly. The entirety of the post is the picture I have pasted here. The problem is that neither Alex nor anyone else actually knows that this is “where we are,” nor exactly what the relationship between innovation and patent strength is — in large part because we don’t really know what the strength of patents is. I love, for example, when the anti-patent crowd crows about patent thickets and their alleged disastrous consequences for complex devices like smartphones — often posted to Twitter from their smart phones. The reality is that we have smartphones and innumerable other complex products besides. Would we have more or better ones if the patent system were different? Maybe – show me the data. Defining the but-for world is notoriously difficult, and I’m not saying one can’t make principled arguments about the patent system without proving a negative. But Alex’s graph and most comments by the patent haters imply a lot more precision about what we know than we actually have. The relevant question is the marginal one, but a lot of the criticism of the patent system seems to me to take advantage of our uncertainty to imply that the benefits of weaker patents would be practically infinite. You can criticize patents for making complex products more difficult to bring to market on the basis of basic economic logic, but when your analysis defines costs with little more rigor than Alex’s napkin contains, your policy footing should be vanishingly small. Frankly, as Richard Epstein points out, Judge Posner’s recent foray into this debate, although longer, is equally short on evidence. Meanwhile Adam Mossoff has explored these issues with some compelling evidence and in great detail in his paper on the sewing machine wars of the 1850s and draws a very different lesson. Nor is there any obvious global sign of patent malaise in the software industry. Last I looked, the level of technological improvement in the electronics and software industries has continued to impress. The rise of the iPad, the rapid growth of social media, the increased use of the once humble cell phone as a mobile platform for a dizzying array of applications—these do not point to industries in their death throes. It may well be the case that a better patent system could have seen more rapid growth in technology. Most important, the patent system just isn’t as “strong” most critics would have you believe. Our liability regime (especially post-eBay) injects enormous uncertainty into the process. Enforcement costs are high. And the patent system doesn’t exist in a vacuum. Antitrust laws, tax laws, trade laws, financial regulation, consumer protection rules, layer upon layer of regulatory oversight, etc., etc. serve to weaken these “optimal” incentives to innovate that simplistic analyses of the patent system largely assume away. Ideally, perhaps, we’d remove all that detritus and then follow the critics’ advice. But that isn’t going to happen, and in the meantime the interactions between various overlapping regulatory and legal rules — including the patent system itself, of course — are complex and poorly-understood. Perhaps we could do better, but it is by no means clear that further weakening patent rights will get us there. And in the meantime, reports of innovation’s death seem like a bit of an exaggeration. Its hard to make absolute statements about causality, but there is plenty of evidence to support Alex’s conclusion. There are tons of patents of obvious ideas and patent trolls producing nothing but punishing those who do. I don’t know how much “data” you require, but the anti-patent crowd has a pretty strong case to support their conclusion. A further reason to put a bounty on lawyers.